I have sold a few paintings in the last week, including Full Tide #3 which is perhaps one of my favorites. I suspect what I feel is a bit like what a parent feels when a child leaves home – pleased but a bit sad or apprehensive too. I hope the buyer’s new artworks makes them happy. It made me happy creating it. 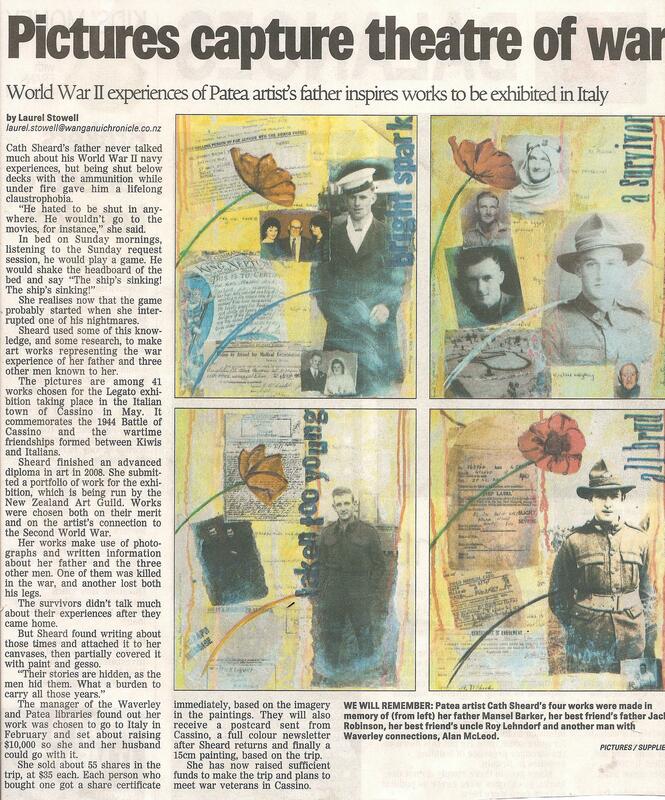 The Wanganui Chronicle ran a quarter page article today on the pieces I have created for the LEGATO exhibition in Italy. Wonderful coverage. They even used my artwork for the full colour banner on the top of the front page! Each year the NZ Art Guild produces an amazing collaborative work, which is auctioned off with proceeds going to the Mental Health Foundation of NZ. I have participated the last two years and am really happy to be involved again this year. We each receive a small panel in the mail, which is partly painted; we paint it and send it back. Apart from one or two committee members, no one knows what the whole thing is going to look like once it is put together. My piece has a deep blue/grey and a couple of shades of warm cream on it. My piece is based on the lyrics of a HIM (His Infernal Majesty) song. For me, but probably not to others, it speaks to my heart about how love saved me almost 20 years ago now. And still saves me today. I have blossomed and grown in the last 20 years with that love. Hence the flowers (blooms). I never go into the details except to say my life was a mess (my “garden of insanity”). Tony, both literally and figuratively, saved me. 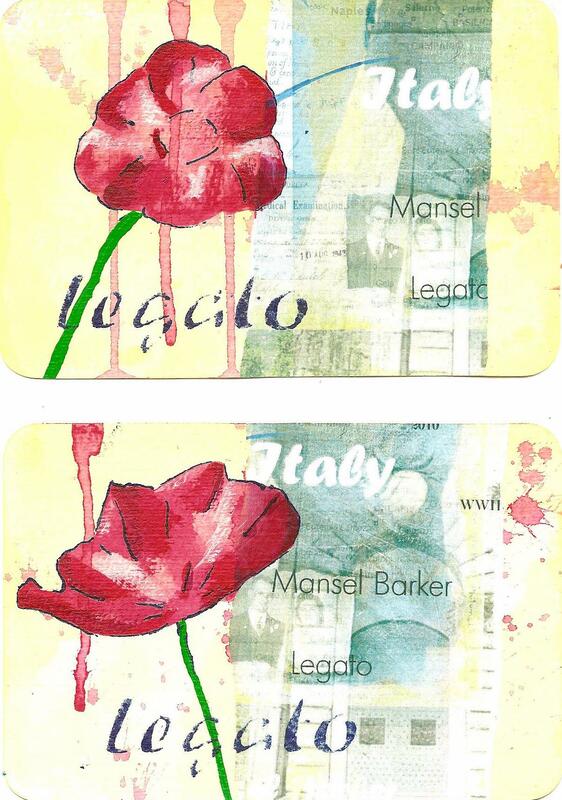 With only a month left till we head to Italy for the LEGATO exhibition at Cassino, I have completed 60 postcards. These will be posted from Casino to all the wonderful people who have bought $35 shares in my trip. Once we get back they’ll also get a colour newsletter about the trip, and by Christmas 2010 will receive a 6×6″ painting as well. I want people who have supported me to feel like they’ve got real value for money. As part of my ‘art share’ offer to raise money for our trip to Italy, for the Legato exhibition, I have to make 60 postcards. These will be mailed back to shareholders once we reach Cassino. I am working on heavy weight watercolour postcards; they come in a little silver tin and the lovely to work with. 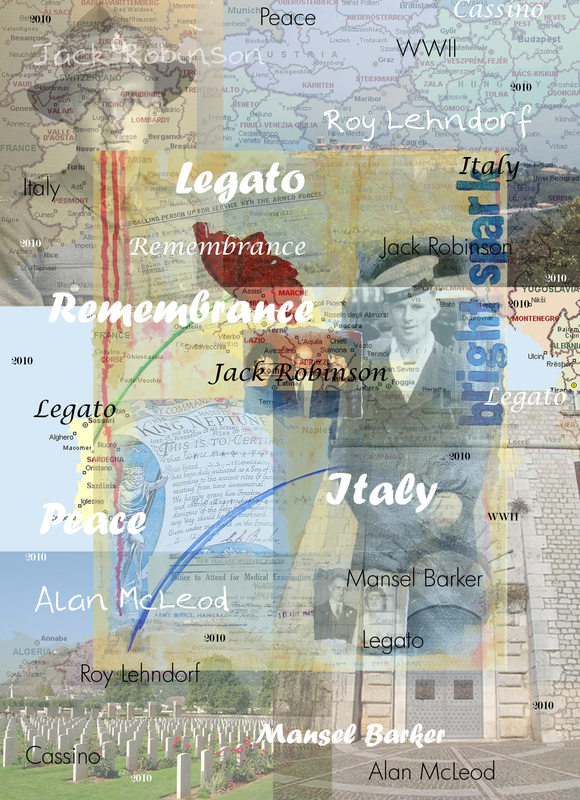 I have made a digital montage of images of Italy and the Cassino area, the artworks I have created for the four men I am honoring, photos of the men, and words about the trip like Italy, Legato, WWII, peace and the men’s names. I’ve printed multiple copies of this A4 montage. I decided to work in two batches of 30 postcards each. I put a very light wash of Nickel Azo Yellow on the postcards then quickly blotted with a paper towel to get some texture. Once that was dry I added splashes of Cadmium red medium and again left them to dry. Once they were really dry I added runs of the same red, quite dilute, as I had done on the original artworks; it brings a sense of blood without being too obvious. Once they had dried, I tore the digital collage sheets into strips and have adhered a strip on each one that is about a 1/3 of the width of the postcard. What comes next? Tomorrow I’m going to hand-cut a stencil of the main lines of two different poppies, using acetate and a tiny soldering iron. In the meantime, here’s the digital collage I made.